Why was this item discontinued? This screen enclosure was discontinued since the wall enclosure does basically the same thing and include six large-screen windows. If you're interested in this screen enclosure please keep in mind the wall enclosure has six large-screen windows that zip closed and most customers purchase that item since it basically functions as a screen house. ***Note: This item is an accessory not a tent! 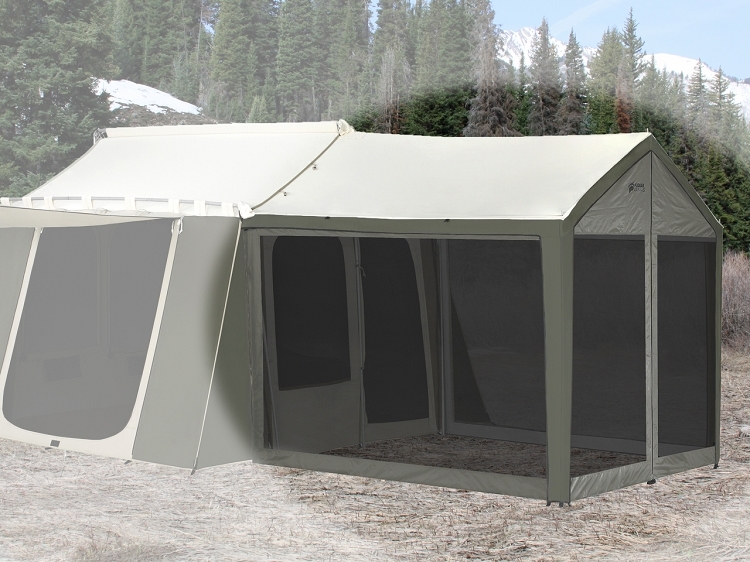 Camp in comfort and style with this premium cabin tent screen enclosure accessory from Kodiak Canvas. Keep dry in these tent accessories made with premium grade, Hydra-Shield 100% cotton duck canvas. The tight weave and silicone finish makes this canvas watertight yet breathable, minimizing condensation and mugginess. Other waterproof tents will easily become hot and humid inside making them very uncomfortable, but not so with Kodiak Canvas Tents. Storm Flaps are on the outside and zip up from the outside. Go ahead and touch the inside walls during a downpour this canvas will not leak water. The Canopy/Awning is sewn onto the roof and is supported by a sturdy metal frame. The sturdy 1 inch steel tube poles with welded corner braces will hold up to the weather. The Kodiak canvas wall tent floor is a super-duty, puncture resistant, 16 oz vinyl with welded seams that keeps water out. The tall ceiling (7.5 Ft at peak) and steep walls (5.5 Ft at sides) provide a roomy interior with stand-up, walk-around comfort. The high quality deluxe 8 x 8.5 Ft. awning creates the cool, perfect picnic area, providing shade from the sun and protection from the weather. A large front door and 1 side doors with heavy-duty #10 zippers offer convenient access. 5 large windows allow ample air flow, and have no-see-um screen mesh, keeping out the smallest pests. Poly sod cloth trim along bottom. Bonus mesh bag and pocket organizer. 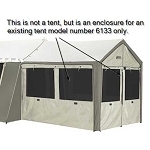 Encloses 8 x 8.5 ft. deluxe awning for models 6133 or 6139. Without the tent, this accessory is of no use. Tent sold separately. I used this enclosure for a 3 days camping. The 3 days of camping we had heavy rain and 18 mph wind. This enclosure put up a good fight. We did not get any rain through the walls, but only the floor (not the enclosure fault). We closed the windows during the rainy day and cooked breakfast and lunch in the awning. The windows are huge. They open from waist height to almost the roof. When the windows are open you have a good view of everything around you. The quality is excellent. This is a must have for your Kodiak Canvas tent. Breathes well with a nice breeze. Can see out all sides. Does a great job at keeping bugs out (if you can keep the kids from leaving it open) :) Anyway, very good product. Surprisingly compact storage bag for this screen. Just installed the screen enclosure for the first time - it was very easy to install and very effective - glad we bought it! We chose this tent after a lot of research and we couldn't be happier. Although a little weighty, my husband was able to put it up and take it down on his own (it's much quicker with two!). We went on our first camping trip last month with our 3 and 5 year old. It was perfect! Room for everyone to sleep, play, and relax. It kept the rain and bugs out but was airy in the heat. The quality is obvious, as is the attention to detail. We look forward to many years of happy camping in this tent. A: These are the only pictures we have of the moment. Feel free to contact us with any other questions. Q: Want to return this item thought I was getting a tent can you help me ? A: We will have someone contact you shortly. Feel free to contact us with any other questions. Q: Does it have a floor? A: This is only a wall enclosure. A: No, it does not have a floor. A: This is actually an awning. It doesn't cover anything. 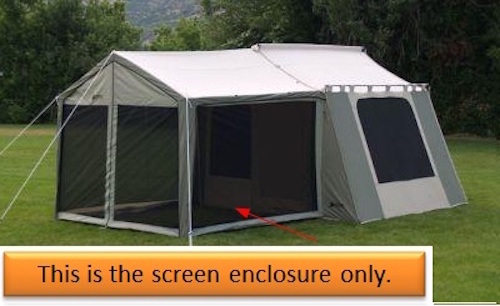 It is simply 3 side walls for an existing Kodiak tent awning-model 6133. It simply will not work in any other application I'm sorry to say. Fast Shipping: Orders for the Kodiak Canvas 0631 generally leave the warehouse within 1 business day.We ship to Alaska, Hawaii, Canada, Australia, and other international locations. Please contact us for a special shipping quote to your location. Delivery Details: This product ships directly from the warehouse in Salt Lake City, UT. This item generally ships via FedEx and may not require a signature. Local Pickup Option: This item may be available for local pickup in Salt Lake City, UT. If you are interested in picking it up locally contact our customer service for a super cheap pickup quote at 866-308-5484.